New Zealand has a vibrant and passionate Japanese car scene, with some of the most impressive and authentic JDM builds over the last decade having come out of the country. No doubt being so close to Japan and also sharing the right hand drive road structure must help car enthusiasts lean towards the JDM styles. Our friend David Atkinson has been capturing the drifting part of this scene for many years and while events are very cool sometimes just walking around the car park with your camera at the ready can unearth some real gems. 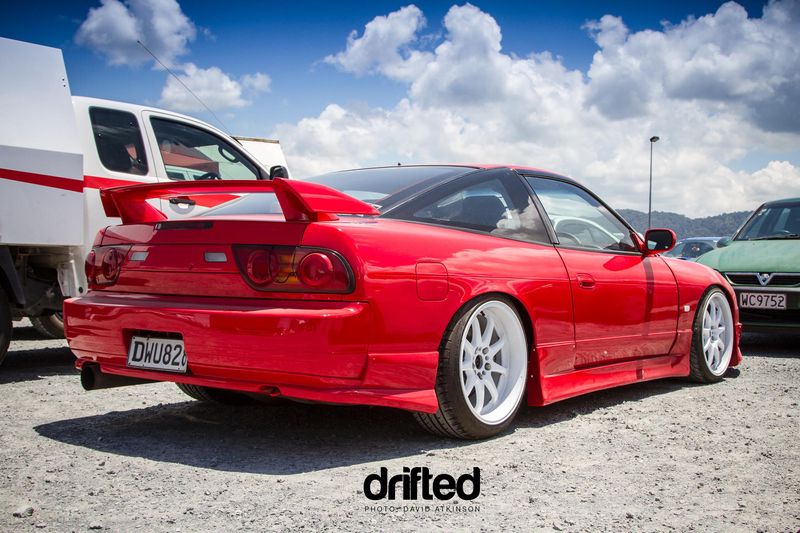 Enter this immaculate Nissan 180sx kouki. The car was parked up in the D1NZ car park and David could not resist taking a snap to share with you. This particular s-chassis is the RPS13 model, it wears a complete kouki (late model) aero kit, kouki tail lights, clear lenses, flared rear arches, coilovers, WORK Emotion wheels and a straight through exhaust. The red paint on the car looks immaculate and the whole subtle package looks so right. Kris Szczepaniec presents event coverage from Formula DRIFT's Long Beach event, round 1 of the 2019 season. Join us as we look at the history of one of the greatest cars to ever leave the land of the rising sun. We’ve provided everything that you need to about the mighty Mazda RX-7. We bring you everything you need to know about Nissan's RB25DET including history, tuning, engine swaps and more. This is the ultimate RB25DET guide. Whether you're a die-hard JDM fan, or you'd just like to know the history of Paul Walker and his love for the Nissan Skyline, we've covered it all in this guide as we pay our respects to the motoring legend. Kris Szczepaniec brings us the freshest photos from The Drift League's 2019 kickoff Irwindale event. We lift the cylinder head on Nissan's mighty VH45DE V8 powerplant to bring you everything you need to know about this robust and powerful JDM engine. Our First Annual Scholarship Has Been Awarded To Retson Ross. LT1 Vs LS1 – What’s Best? With the LS, upgrade prices are likely to be higher, but the convenience of them would most likely make them far easier to obtain. You'd also need to source far fewer parts to achieve substantial power figures. What Is A Stroker Engine? Want to increase your engine's displacement? Then you will need a stroker kit. What is a stroker kit? Let's find out!